Combine ½ lime juice, ½ cup cilantro, ½ cup olive oil, soy sauce, tequila, 7 cloves garlic, lime zest, cumin, oregano and pepper in a medium casserole dish. Place the tri-tip in the marinade to cover both sides. 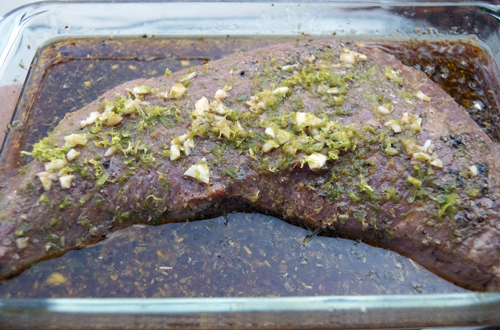 Marinate the tri-tip for at least 4 hours (preferably over night), flipping occasionally. Grill the tri-tip over medium-high heat until cooked to desired temperature (about 8 minutes per side for medium rare). Cover and allow to rest for 10 minutes. For the sauce, combine the sour cream, avocado and remaining ingredients and whip with a fork. Top steak with sauce to serve. 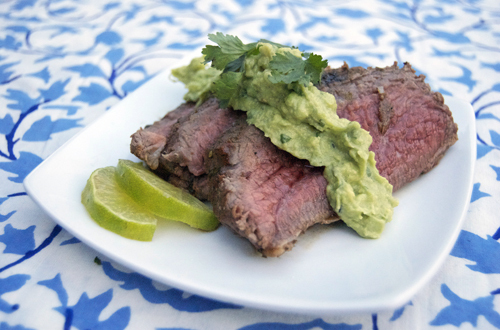 I love avocado, and that tri-tip looks like it’s grilled to perfection!